Unveiled at Mobile World Congress? Following leaked images of a prototype 'PlayStation Phone' earlier last month, the CEO of Sony Ericsson mobile phones has alluded to the development of the gaming phone, claiming that there is "no smoke without fire." Of course, this is far from an official confirmation that such a 'PlayStation Phone' exists, although it strongly suggests that Sony Ericsson and Sony Computer Entertainment are looking at ways of jointly developing gaming on mobile phone. "There's a lot of smoke, and I tell you there must be a fire somewhere," Sony Ericsson Chief Executive Bert Nordberg said in an interview with the Wall Street Journal, when quizzed about the leaked images' authenticity. "Sony has an extremely strong offering in the gaming market, and that's very interesting." Whether or not Sony Ericsson's new gaming offering will be PlayStation-branded or Xperia-branded is still to be confirmed, although however the gaming controls on the device are developed and marketed, the phone is set to run Google's Android 3.0 OS when it arrives at some point later in 2011.
iPhones and other current smartphones with touch screens are still not "optimized for games," argued Sony Ericsson's Nordberg. "I haven't dug into that history, but the future might be brighter," adding, "I'm very glad that we work with a company like Sony, who actually knows how to do it." 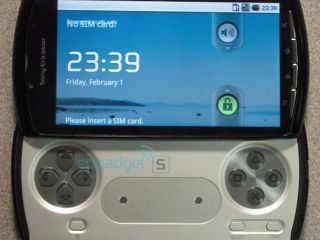 PSP Phone in Barcelona next Feb? The Sony Ericsson CEO added that there was no technological issues in developing such a phone, but that the major hurdles were legal ones – discussing game rights with third party games publishers. "Sony is of course a very strong brand, and why shouldn't we use that?" said Nordberg. "Gaming, including content, is a very interesting proposition."